And another year rolls to a close. . . . 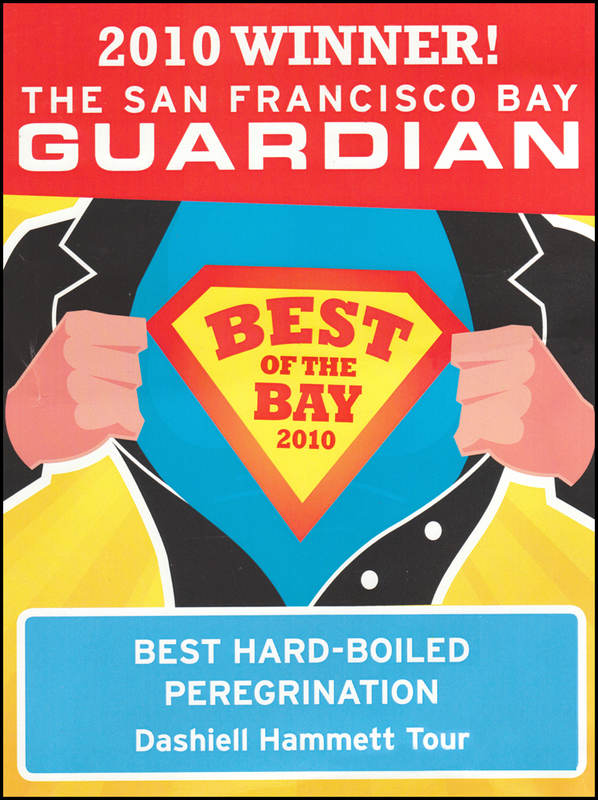 Which got me thinking about tinkering with my sidebar on the blog, switch it up a bit. . . .
And I realized that the Bay Guardian Award for 2010 was getting a bit old. My first thought was that I could dig out earlier Award posters — think I have at least three or four — and do a little parade of images. I didn’t win every year, but then it’s not as if they have best hard-boiled tour as a category every year — or why wouldn’t I have won every year? Then I heard a news bit on the radio — tuned in partly through the info — that suggested that the Bay Guardian was closing up shop. Of course I haven’t been paying close attention, even though I did a review column for the BG for awhile. That, too, is retreating further and further into the past. . . . So I looked on the net and found that the Bay Guardian is probably going to close down, unless they can find a buyer to carry on. I enjoyed the brief encounters with Brugmann, certainly a local legend — in part because I knew quite a few people who absolutely hated him. At some point before my time, late 1960s I believe it was, there was a newspaper writers strike in San Francisco, and Brugmann decided he wasn’t going to have the Bay Guardian pushed around, and broke the strike. Made enemies for life. Margo Skinner, companion of Fritz Leiber during his San Francisco years, was one of them. And I think it was at a Fritz und Margo party that I met another longtime local writer who was still gripping about the strike something like 15 or 20 years later — that guy was married to, or living with, the woman who was the real life model for the main female character in Jack Kerouac’s The Subterraneans. And if memory serves, without digging around in the archives, I’m pretty sure that it was in the pages of the Bay Guardian that the Hammett Tour got its very first write-up. If it is over, Adios. This entry was posted in Frisco, News, Tour and tagged Bay Guardian, Bruce Brugmann, Fritz Leiber, Jack Kerouac, Joseph Alioto, Margo Skinner. Bookmark the permalink.